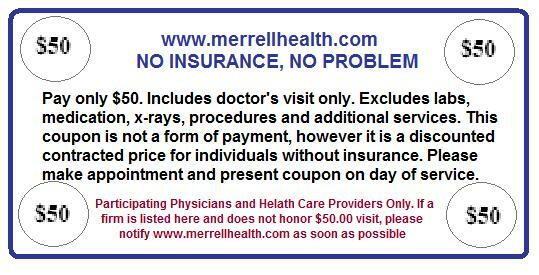 NOTE: You can ask any physician or medical office, if they are willing to honor this $ 50.00 Visit Card. Many physicians are willing to accept a payment of $ 50.00, however, they do not wish to advertise this low price. We have several physicians who are willing to advertise this price, below. Check with your physician, a& ask them if they are willing to accept the $ 50.00 Coupon for an office-medical visit. Reduce Your Costs for Prescriptions, Laboratory Testing and Scans. My name is Bill C. Merrell, Ph.D. I have enrolled in the GBR Plus* plan for $ 12.95 per month. This allows me to call a Physician if I have a problem which requires an antibiotic, saving me from having to go to an urgent care center or a Hospital. This saves me hundreds or even thousands. It doesn't matter if I have insurance or not. I can save My Precious Time ! I consider my time valuable ! Your time is valuable as well. Sign Up Today!!!! If you don't like it you can cancel any time! You are not locked in. This is for the GBR PLUS CARD. The Discount Prescription Card is FREE!!! Questions? Do you want a laminated card? of a student or grad of the Merrell Institute. All are invited to use this service ! and if you mention the world terrorist, a free colonoscopy, with no wait ! Just a bit of humor ! Enjoy the day and save money by visiting the doctors above and save even more money with our discounted prescription card.